New Hartlepool boss Matthew Bates. Hartlepool United boss Matthew Bates has underlined his ambitions for 2018/19 - with stability the key component. It’s been a tumultuous time at Victoria Park over the last 12 months, which started when Pools dropped out of the Football League for the first time in their history. Raj Singh and Craig Hignett with Ged McNamee, Matthew Bates and Ross Turnbull. Threats of administration, liquidation, phoenix clubs, ownership wrangles, takeovers falling through, then going through, the threat of dropping out of the league, if the club remains solvent - the season had the lot. Now under a new owner, with a new board of directors, chief executive, chairman, director of football and manager, Bates is hopeful that stability will rein supreme next season. “This season is about stabilisation,” said 31-year-old Bates, who was appointed alongside first-team coach Ged McNamee and Ross Turnbull last Friday. “There is no real pressure on me to go out and get promoted. Ged McNamee with caretaker Matthew Bates. “We want to get a team out there that the fans can be proud of. “We want to be solid, be consistent and finish as high as we can. “We need to build towards getting this side promoted. It is a process, a process I want to enjoy. Everyone is singing from the same hymn sheet. Despite ambitions being modest this season, compared to the pre-season talk of promotion charges last summer, Bates is not ruling out going above beyond what is expected of Pools by those at the top. “Something is building here,” he said. “Higgy (Craig Hignett), the new board, the new chairman – everyone is pulling in the right direction. “You can’t underestimate that. You can’t build success when there is rifts behind the scenes. “We need to get this club stabilised then get out the conference as soon as possible. After a short break Bates’ work will start in earnest, with retained lists to publish, pre-season schedules to plan and transfer targets to draft. While Bates put a lot of the groundwork in before he even got the nod for the top job, he says the managerial game, especially at Pools, has been a baptism of fire. 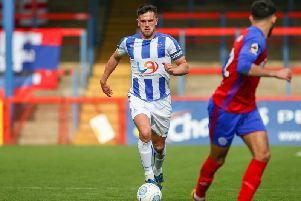 “This 13 games has given me a taster of what is to come,” he said of his spell as caretaker, which saw Pools win five and edge well clear of the fifth tier dropzone. “I have to say I was looking forward to the end of the season, but now it is harder work than it was before. “We (Bates and Hignett) have a bit of time to think things through in the office - work out how I want to do things next season. “I have got people around me who are experienced and can help along the way. While the idea had been to cut cloth to suit this summer, Bates’ appointment as boss has resulted in a little rethink by those at the top. The original idea had been to run the club with a skeleton coaching setup, most likely with just a manager and a coach alongside him. But the success of Bates and McNamee and Turnbull alongside him, with the trio coming as a package, has led to a redrawing of the blueprint, somewhat. Bates said: “The two lads were working for free. “They enjoy what they do and they enjoy the people and what they are. They have the respect of the lads. For that they deserve a lot of credit. “The players responded well to the coaches. Scott Loach has been great all season but you’ve seen how he has improved in recent weeks, he’s really gone up a level. “Ged has a hell of a lot of experience, has great man-management skills when he works with the players and his coaching. You can’t fail to respect a man like that. Opening up on the role of ‘extra’ coach Turnbull, Bates says his job will be a whole lot more than just taking Loach and youngster Ryan Catterick. “Ross has come in as the goalkeeper coach but he will be doing a lot more than that,” said Bates. “On a day to day basis there will be tasks he has to do and he knows that. “His history in the game and the managers he has worked under it is good to have him around. If you can’t take advice from someone like him, who can you take advice from? Whatever the roles, Bates is certain he has the balance right behind the scenes. Now the key is to make sure he gets it right on the park, too, with a crucial summer of recruitment ahead. “Sometimes I ask myself ‘why do I want to be in management?’ But I do enjoy it. And I feel I can take this club forward,” said Bates. “What has been printed in the past and what has gone on is now fish and chip paper. What we have to do now is make sure we take that end of season, the confidence, into next season. “The way the season ended has given me confidence moving forward. “When you start a new job you are never sure how things will pan out - everyone is the same. “This is something I want to do long-term but I am still learning every day. “Ged has been great behind me. He is at the other end of the spectrum having been a coach for many years. “He has been a great help and will be moving forward. “We have a good balance in the staff. Now it is important that we get the balance right on the pitch as well.